Dormant Oil is a known application that is sprayed on landscape trees and shrubs in fall to help protect them from overwinter damage from insects. Prepared from a mixture of highly refined petroleum oils combined with an emulsifying agent, dormant oil can be mixed with water and sprayed on trees killing exposed insects and mites by either suffocating them or destroying internal cells. These oils are effective in controlling most species of scales and mites that overwinter as nymphs or adults such as cottony maple scale, obscure scale, euonymus scale and lecanium scale which can do early damage. Dormant Oil is also effective on insect eggs that are laid in September and overwinter such as aphids, leafrollers, Spruce Spider Mite, Honeylocust Mite and European Red Mite. Dormant Oils are effective for both immediate and preventive care and have been developed to be less harmful to beneficial insects. They are also safe for birds, humans and other mammals. When to Apply: Dormant oil applications should be applied in fall when temperatures remain in the 50’s at night (Early October) and must be done when temperatures stay above freezing for 24 hours. Dormant Oil is also best applied on a clear day with no wind and no threat of rain within a least six hours so that the oil can dry. It is preferable to choose a time when no rain is in the forecast for a few days to ensure effectiveness. Warnings: Be sure to follow all label directions because oil sprays may damage certain plants, including Japanese maple, Eastern Redbud, sugar maple and Amur maple. It can also cause the foliage (needles) of Colorado blue spruce to become discolored (change from blue to green) since the pigment is formed from the oils on the surface of the plant. 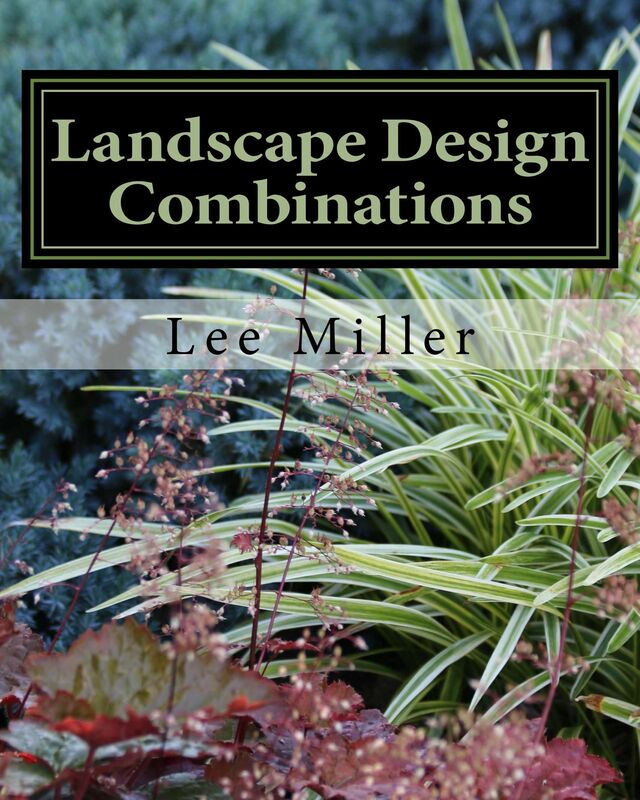 When in doubt consult with your landscape professional. Dormant Oil when applied correctly will help to protect your trees and shrubs from winter and early spring harm from a variety of damaging insects and will ensure the health and vitality of your landscaping. 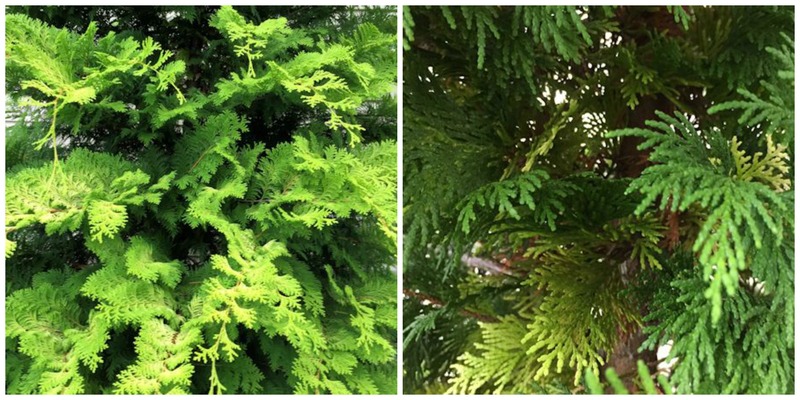 If your evergreen’s inner needles are suddenly turning from a healthy looking green to shades of yellow, orange and brownish-red in late summer and fall there is little need for concern…it is all part of a natural process. Each year evergreens will produce new foliage in spring and they prepare by shedding their older foliage in the previous late summer and fall. 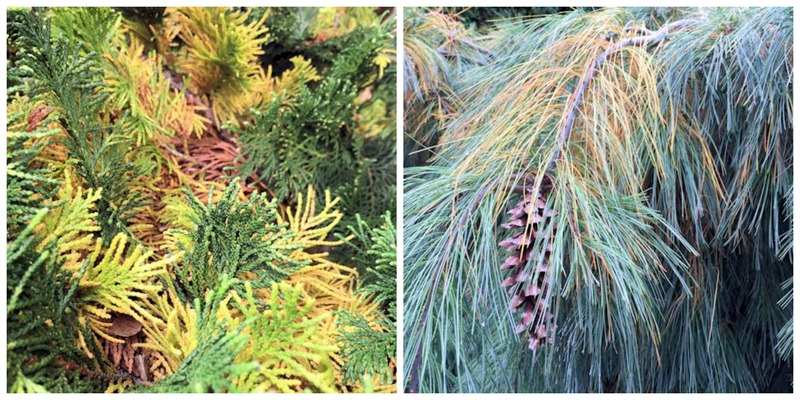 Shedding of needles and foliage is a natural process that evergreens go through as a way of preparing for new growth once the weather warms. As the days become shorter and temperatures lower evergreens go through a slight dormant period similar to deciduous trees and shrubs. Many evergreens such as pine, cedar, Chamaecyparis (Hinoki Cypress), Thuja (Arborvitae), fir, hemlock and spruce lose some of their needles every year and may go through a major shedding every three to five years. 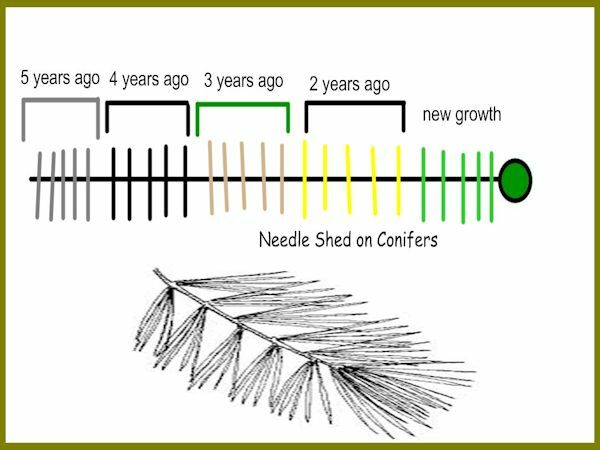 Fall Needle Shed on Hinoki Cypress and White Pine in late September-November-Shedding can be light or more pronounced. Lightly shaking the branches can help along the natural cleaning process. To examine, look at your tree carefully. Older foliage is shed first so the losses should generally be from the inside out and not at the tips. Prior to shedding the needles appear from green to yellow, orange and eventually brown, remaining on the tree until the process is complete. The actual amount of needle shed on the tree or shrub varies depending on the growing season, temperature changes and amount of rainfall, and can sometimes be sudden. Often the change is unnoticeable but generally the drier the season or more drastic the temperature change the more noticeable the needle shed, a natural cleaning process leading to new growth in the spring. 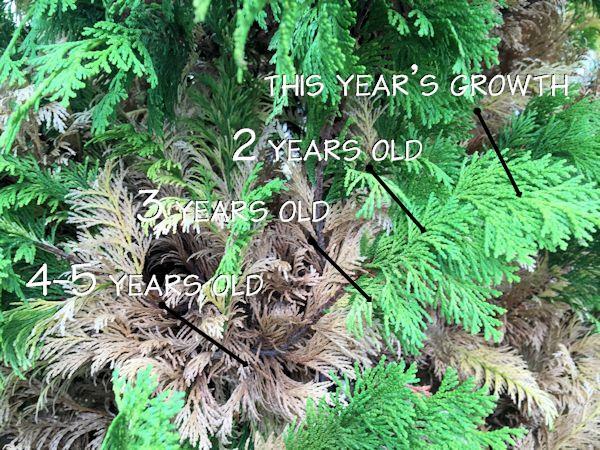 Fall Needle Shed on Evergreens Showing Previous Year’s Growth. Older Growth is closer towards trunk. Other species of evergreens in the broadleaf category can also shed their leaves. Evergreens such as holly and laurel retain their leaves for only one year and rhododendron and azalea for one to two years. Leaves will appear yellow before falling but at some times may go unnoticed if new leaves conceal old foliage. This process usually occurs in spring when new growth is appearing but can happen at other times of the year as well. 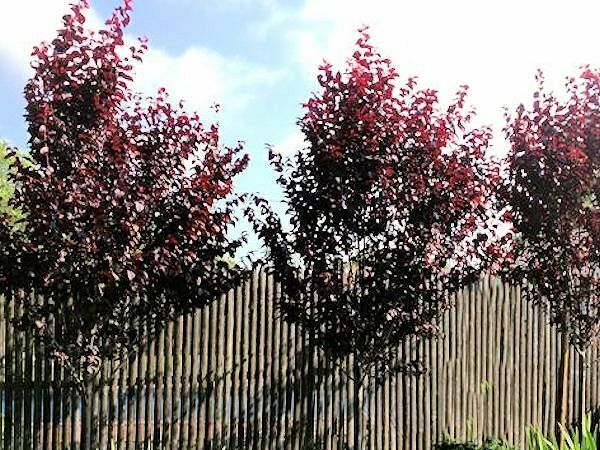 If the whole tree or entire sections of your conifer are turning brown then there is cause for concern and you should have a certified arborist or landscape professional examine it. Otherwise, fall yellowing or browning at the base or inner branches closer to the trunk seldom indicates a serious problem, but is more often part of the natural life cycle of the tree. This is an excellent and informative post from Nitty Gritty Dirt Man on digging up and saving your Elephant Ears for next season. The October weather has been strange. 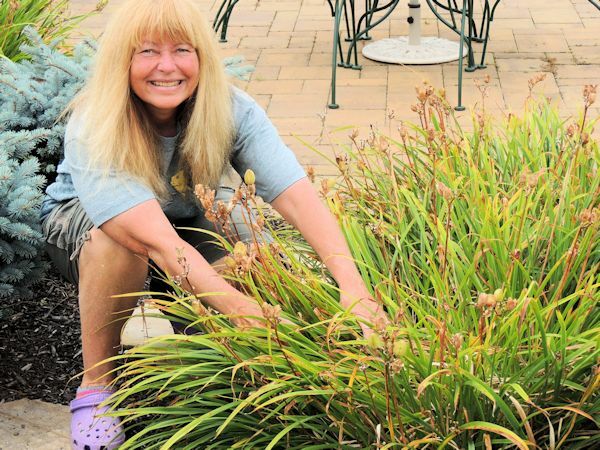 There was a moment when it felt like autumn, but then it became more mild and humid — and so I let my tropicals stay in the ground. But how much longer will I be able to get away with that? At some point, it will become cooler and frost will arrive — and these tropicals need to be stored for the winter. This will be my weekend project — and since I’ll be a bit busy, I thought it was the perfect time to re-visit a previous post that chronicles the process. Up first are the elephant ears. Welcome to Fall! It’s time to spray your trees with dormant oil. Dormant oil protects your ornamental trees, shade and fruit trees by placing a protective coating on the surface smoothering out any insect larvae that can hatch in the spring and do damage to your plants. Dormant oil is an important tool to manage certain pest problems such as scales, aphids, whiteflies, caterpillars and mites during the winter while your plants are dormant. Spraying of dormant oil should occur on a clear day when the temperatures are expected to remain over 50 degrees F. for at least twenty-four hours. The ideal temperatures for application is between 40 and 70 degrees F.
WHAT INSECTS ARE CONTROLLED BY OIL? Always read directions before application. Avoid using on plants that are oil-sensitive. Having a regular spray program with proper care of your plants will increase the long-term health and vitality of your landscape and possibly eliminate any major damage due to invasive insects. Happy Gardening!